West Brom say striker Peter Odemwingie acted "wholly unprofessionally" after his apparent attempt to open talks with QPR without the Baggies' permission. The 31-year-old arrived at Loftus Road on deadline day, but West Brom stated no fee had been agreed and he was not free to discuss personal terms. Chairman Jeremy Peace said: "Peter has acted wholly unprofessionally." QPR say Odemwingie did not enter club premises and Hoops boss Harry Redknapp put the situation down to a "mistake". "It was unfortunate really. Wires got crossed somewhere," Redknapp told BBC Sport. "We were trying to sign him and the lad thought a fee had been agreed between the two clubs. It hadn't - there was still some haggling going on. "He's a good lad - it was just a mistake. That one is dead." West Brom admitted that talks about a possible move had continued on deadline day, but had "proven fruitless and no agreement has been reached". Odemwingie was the target of an unsuccessful R's bid of about £3m last week and had put in a transfer request. Peace said: "This evening's developments have brought a conclusion to what has been an unsavoury affair. "As our sporting and technical director Richard Garlick has repeatedly said in recent days, we had no need or desire to sell our core players. "Neither materialised and, in the end, the matter became a point of principle as much as anything." Peace added: "He must now accept the fact he remains under contract for a further 18 months and has to focus on his Albion commitments." 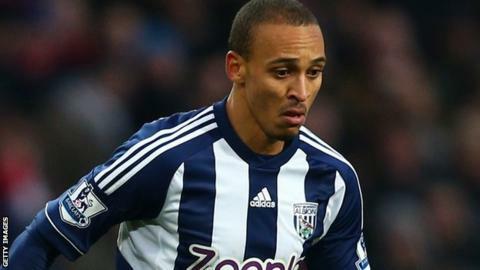 Odemwingie had appeared optimistic that a deal could be reached when he was interviewed on his arrival in west London. "I hope they will be happy with what they get and, of course, they want to get in players themselves. I just hope that everything will be sorted out in the next few hours," Odemwingie told Sky Sports News at the time. The Nigeria international had previously been quoted as saying that he had reached an informal agreement with West Brom on his departure, only to find that the situation had changed when he was en route to London. "I am disappointed this is all happening. I met with [Albion sporting and technical director] Dan Ashworth this morning and we shook hands that I could leave with his blessing if the £3.5m fee was met," the striker told the Daily Mirror. Redknapp said earlier in the day that Odemwingie was still a player he would like to bring into his squad. "He's got pace, I really like him and I think he could help us," he told the the club's official weekly phone-in show 'London Call-In'. But West Brom's determination to retain the player appears to have won out. Odemwingie, a £2.5m signing from Lokomotiv Moscow in 2010, tweeted on Sunday night: "Looked through my tweets. Deleted some. Was too much. Only excuses - home alone, dark, son and wife in hospital, frustrated." His deleted tweets included: "Last season January window is when I should have handed in transfer request. Was one foot in Rubin Kazan - not for sale. Fulham. Not for sale. Newcastle. Not for sale. Wigan. Not for sale."